Review: When John Carpenter’s Halloween changed the face of horror films in 1978, it was not a cut and dry deal that a sequel would creep its way into production. At the time, sequels weren’t looked at with the most respect and very few films warranted them outright anyway. Keep in mind, this was right around the time that the teen horror flick was still finding its footing and the multiple sequels to Halloween, Friday the 13th, and A Nightmare on Elm Street hadn’t started to ramp up yet. In 1981, the original Halloween was three years old and Friday the 13th was getting ready to release its first sequel. The studio brass at Universal Studios came-a-knockin’ at the door of Carpenter to see if he’d be interested in directing the sequel to his megahit. Carpenter was a hot commodity with The Fog and Escape From New York under his belt and was the obvious person to go to when a continuation was needed. Carpenter declined to sit in the director’s chair but instead contributed to the script and some last minute pick-up duties (i.e. they brought him in when there was a need for more blood and kills). At the end of the original, escaped killer Michael Myers had fallen off a balcony after being shot several times by Dr. Loomis (Pleasance) only to disappear into the night. A master touch (for the time) by Carpenter, this would be looked at nowadays as a cheap ploy to leave the possibility of a sequel open. In the case of Halloween, it served for one last scare as Carpenter left you with the feeling that Myers could still be around any corner, ready to pounce. Picking up precisely at the moment the first film ended, Halloween II follows sole survivor Laurie Stode (Curtis) to Haddonfield Hospital where the staff is picked off one by one by the masked killer who has come to finish his business. It’s not that far-fetched of a plot, actually, and its simplicity and efficiency is classic Carpenter. Along the way we learn a little more about the history of Myers and his connection to Laurie, and also gain a bit more insight into the obsession that Loomis has with his patient. Taking the directing reins from Carpenter was Rosenthal (who would later come back to direct Halloween: Resurrection) and he maintains Carpenter’s minimalist approach while injecting some necessary life into characters and plot turns. Because the film is really a continuation of the first, it was pretty much required that part II look and sound like the original and I think all involved met that challenge. As far as horror sequels go, Halloween II is one of the better ones because it sticks to (some would say copies) many of the techniques that made the original so noteworthy. Placing its characters in situations where they are at a disadvantage but not helpless contributes to the realistic tone. As the sequels would go on, logic would be pretty much heaved out the window but in the second outing of Myers there’s little that will ring false to the horror minded cinephile. It was pivotal to have the two leads from the first film return. Pleasance was by all accounts a very eager-to-please actor and signed up for the film without much grumbling. It helped that there was some nice character development for him that I’m sure kept him interested and gave him something to work with. By this time, Curtis was the reigning Scream Queen, having starred in four horror films (The Fog, Prom Night, Terror Train, and Road Games) in the three years since the original but she doesn’t have much to do but look dazed and confused for the first half of the film. It’s only when visiting hours bring a killer to her door that she has to fight for her life for the second time in one long Halloween night. 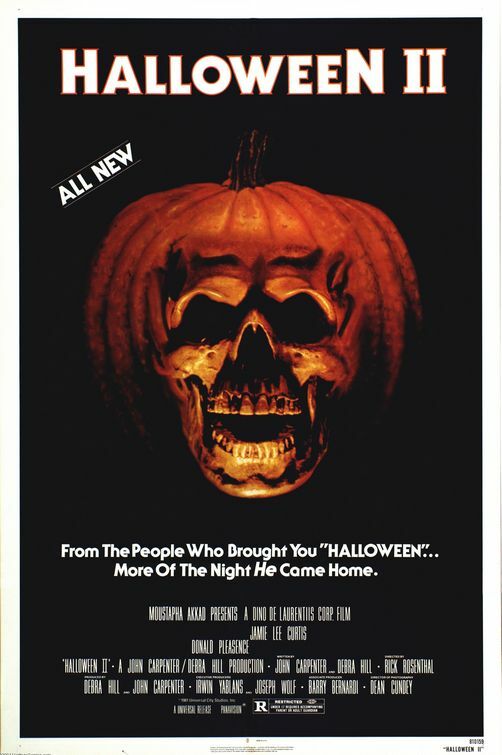 Some interesting kills and several clever uses of camera and lighting to create some ample scares helps to give Halloween II high marks on the thrill scale. It may be blasphemy, but I enjoy Halloween II maybe a little more than the original. There’s something about its pace and through line that has always provided good entertainment whenever I find myself re-watching it. It absolutely makes for a nice double feature if you are checking out the original for the first or fortieth time.